At the age of just five, Saroo Brierley fell asleep on a train and woke up hundreds of miles away in Calcutta. Unable to find help, he survived for some time on the streets of Calcutta before being taken to an orphanage and soon after adopted by an Australian couple. Twenty five years later, with the help of Google Earth, he managed to finally find where he came from and travelled back to India to try to find his family. 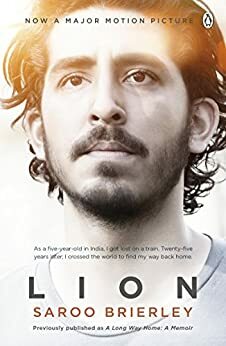 Lion was originally published as A Long Way Home and of course recently has been adapted into an award winning film starring Sunny Pawar, Dev Patel and Nicole Kidman. I haven’t seen the film – I usually prefer to read a book first – but based on the book, I can imagine it will be quite an emotional rollercoaster. It’s hard to imagine how a small child could go missing and that nobody would help him. I was horrified to read that even today there are an estimated hundred thousand homeless children in Calcutta. When we think of a child going missing, I think we imagine just one wandering around easy to spot, while adults frantically try to find them. But Saroo was clearly just one more child among many. It was also hard to believe that a five year old would go missing for more than a week before his family would report him missing. India, however, has a very different culture to ours and the author explained that it was not unusual for children to be in and out of other people’s houses and not see their parents for some time. Lion is a fascinating book and a very readable account of the author’s experiences. I was particularly interested in reading about his tale of survival on the streets, the way that new technology helped him identify where he was from and finally his return home. It seems strange to say that I enjoyed the book, given that it was about such a frightening experience for a small boy, but the story of what happened to him afterwards and how he reconnected with his birth family is one which is really amazing to read. It was a real eye-opener making me think about the kind of poverty people live in in India even today. A heart-warming and uplifting memoir. Your list must be as big as mine Anne! I read this book whilst in India, absolutely ace for immersion into the culture around me. The film is a tad mawkish but I cried buckets because the Saroo child and adult are played by wonderful actors! Perfect place to read it! I have heard both actors were brilliant.